Kevin Cox is the Program Manager for the Continuous Diagnostics and Mitigation (CDM) Program, within the Department of Homeland Security’s Office of Cybersecurity and Communications. In this position, Mr. Cox leads the effort working collaboratively with federal agencies to deploy cyber security solutions to 1) identify agency networks and assets and 2) protect them and agency data in near real-time against the growing cyber security threats. 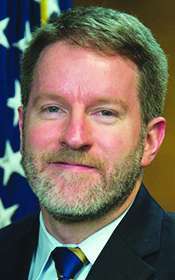 Prior to joining DHS, Mr. Cox served as the Deputy Chief Information Security Officer (CISO) at the Department of Justice, where he oversaw the organization’s Cybersecurity continuous monitoring capabilities and the security posture dashboard. Mr. Cox holds M.A. degrees from West Virginia University and the University of Chicago.